This is the REAL format of Brazilian football pyramid, created for the first time ever in the history of Football Manager. 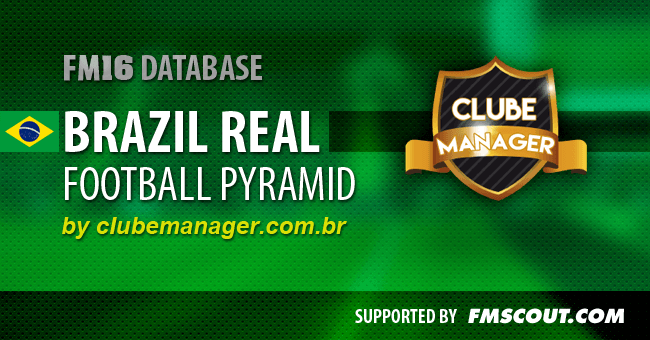 The team from Clube Manager has undertaken this great project and wants to share it with the FM Scout community. Added State Cup in the second half with participation of teams that do not play in any active divisions and if calendar allows. Added campeonados U-20 and U-17. Added Brazilian and South American press and media. Espn, Globoesporte.com, Fox Sport , SporTV, L'equipe, Bandeirandes TV, O Globo, Diario Olé, La Nacion, Etc ..
PVC, Grandson, Edmund, Juca Kfouri, Ale Oliveira, etc. Note: Reputation of leagues and clubs has not changed, as well as player skills and their PA / CA. This database was created by members of the Clube Manager forum community. Thanks to: André Luiz, Bruno Roberto, João Leonel, Jeferson Peil. If you spot any errors with this database, please comment to help us bring further improvements to this project! 11 comments have been posted so far. eu já vi esse update. só que com outro nome. I have seen this update. but with another name !? I only got one question, i took over RedBull Brasil and i started 1.July ... now the League D says that the Fixtures will be done on the 3rd. July and as time passed by i just realised i dont have any fixtures ??? could you or anyone else explain to me when i am going have them ? after the first stage of D will there be a second one with me in it or will it go into play offs without me ??? This database is excelente, but it has a bug!!! Everytime the saved game crashes on tês same date: April 20h, 2016! Please, if the owner could fix it I would be very thankful!!! I wanna get Sao Caetano back to glory. How do you get promoted into Serie D? Have to do well in the state leagues?